Our 5 lane, 25 yard pool is a great place for adults to enjoy exercise or begin a learn-to swim program. 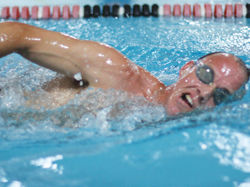 We offer a variety of water exercise classes that are as challenging as traditional land exercises, suitable for swimmers and non-swimmers alike. In addition, we offer many hours of lap swim throughout the day. Enjoy time in our beautiful 5 lane, 25 yard pool! We offer many hours of lap swim throughout the day and evening. Free for Total Facility Members. Membership card must be presented to the lifeguard when entering the pool. See the adult swim schedule for lane availability each day. Members interested in exercising as well as non-swimmers looking to practice are welcome to attend lap swim when lane 1 is listed as available. This also includes when All Lanes Lap is listed. Lap swimmers must be 10yrs+ and able to swim 8 consecutive laps. A lap lane can be shared with up to 5 lap swimmers. Once 3 members have entered a lane circle swimming is required. 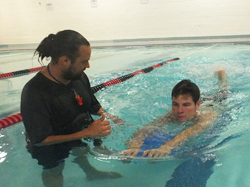 An aquatic exercise program designed specifically for people with arthritis, osteoporosis, and related health concerns. This program uses gentle activities to help increase joint flexibility and range of motion, to maintain muscle strength, and to increase stamina. An invigorating workout where aqua meets dance. We will make you sweat while having fun at the same time! It combines a variety of workout styles including deep and shallow cardio exercises, equipment and fun DANCE moves used for muscle toning! 1/2 hour $50 or eight 1/2 hour sessions for $360. Have you ever had knee or hip surgery? Are you interested in trying something new and effective? If you answered YES to any of these questions then The Connection’s Aquatics Personal Training is right for YOU! 1/2 hour $50 or eight 1/2 hour sessions for $360. Semi-private lessons also available for $75 per 1/2 hour. Certified staff members help you build and improve upon your swimming techniques. Free to our senior members, three afternoons per week. Enjoy family time swimming in the pool. Parents must accompany children in the pool. Children without a parent must be at least 10 years of age. Noodles, balls and toys are available. Infants and toddlers must wear two swim diapers: a non-disposable swim diaper with gathered legs and waist (available at Front Desk) over a disposable swim diaper. Free for Total Facility members or $20 family pass for non-members available at the Front Desk. Bring your kids, Infants- 6yrs, to enjoy play time with you in the pool. All children must be accompanied by an adult in the water. Have fun with toys, balls, music and more! $7.00 daily pass per child available at the Front Desk.